Featuring the Turkel Design signature post-and-beam construction and an open great room breezing out to a private courtyard, the 2,110-square-foot Axiom Desert House draws from the lifestyle and culture of Palm Springs—seamlessly blending indoor and outdoor living while incorporating innovative and energy-efficient products and systems throughout. Recently completed in February 2019, Axiom Desert House made its debut as a Featured Home at this year’s Palm Springs Modernism Week—turning heads as a stunning, systems-built jewel that is now the private residence of designers Joel and Meelena Turkel, as well as a Living Lab for Turkel Design. The home’s open plan, indoor/outdoor flow, and thoughtful use of sustainable materials are a testament to modern prefab, celebrating transformative design that is simple, elegant, and replicable. Axiom Desert House has been designed to exist as a hybrid of learning, living, and collaboration, a story we have been telling from start to finish on our social media channels throughout 2018 and 2019—breaking down the process that Turkel Design has refined as a practice over the past decade. Furthermore, Joel and Meelena Turkel took this project as an opportunity to turn the lens on themselves as both designers and clients, while teaming up with numerous esteemed partners whose carefully designed products are integral to the home’s success—offering Turkel Design the opportunity to experiment with new materials, finishes, and processes, while paying careful attention to ensure that Axiom Desert House, like all of our projects, feels like home. To receive invitations to open houses and design events at our Living Lab, join the TD Community here, and follow us on Facebook and Instagram to stay up-to-date on all of our projects across the U.S., Canada, and beyond. Watch as we told the story of Axiom Desert House from start to finish, and follow us on Facebook and Instagram for updates on what’s happening next at the Turkel Design Living Lab. Dwell’s Final Reveal of Axiom Desert House - Featuring Marvin, Dacor, and The Modern Fan Co.
Once we chose our site for Axiom Desert House, we began the necessary regulatory research, which we translated into representative visuals—something we do for our clients on every project. The first step is to create a 3D digital site model—helping our clients visualize their project and consider any site-specific factors. We began program development and schematic design by planning minor modifications to the Axiom 2110. Once Joel and Meelena submitted design requests, we generated a 3D model, breaking it down into sections. Using a digital 3D model, we created an exterior siding and cladding visualization study—looking at the house with three possible siding/cladding options. Because of the hot, dry Palm Springs summers, the best choice for the exterior facade was a combination of stucco, concrete block, and thermally modified wood. Our weather-tight shells are precision-fabricated in a stabilized factory setting—unaffected by varying weather conditions. While the package was built in the factory, a local contractor laid the foundation on-site—a more efficient use of time and resources. When the foundation was ready, the weather-tight shell was stacked onto a truck and delivered to the site as flat-packed panels. An experienced crew began unloading and preparing assembly—much faster and with more precision than conventional construction allows. The panels—fastened to the concrete slab with seismic hold downs—are made with laminated strand lumber (LSL) instead of dimensional lumber, an engineered-wood product that transforms scrap wood into solid wooden members. Designed for weather resistance, it is a lot stronger and more dimensionally stable than traditional framing materials—making it less likely to warp or split. We worked with BC Timber Frame to source our Douglas fir glulam beams—using Select Structural, the highest grade of local Douglas fir timber known for its beauty, structural integrity, and fewer and smaller knots. Our beams are custom-tapered and surfaced with solid, edge-glued, finger-jointed, vertical grain, old-growth fir—achieving an exquisite furniture-grade beam. See how our crew carefully placed the beams onto the prefab shell. Windows play an integral role in Turkel Design homes, and the Marvin Clad Ultimate Series from our Axiom Desert House partner Marvin—shown here being installed on-site in Palm Springs—creates a seamless connection between living spaces and outdoor areas, framing mountain views while letting fresh air and natural light flow throughout the home. With the windows from our partner Marvin installed, Axiom Desert House was ready for the Ultimate Lift and Slide Doors, opening the great room, master and guest bedrooms to the courtyard. These stunning doors play a central role in creating a strong indoor/outdoor connection, effortlessly lifting and sliding into hidden pockets in the walls for dramatic effect—allowing natural light to fill the space. To learn more about our collaborative partnership with Marvin, click here. We’re taking a look back at this sneak peek into our kitchen, including our custom built-in cabinetry that was manufactured in a stabilized factory setting. 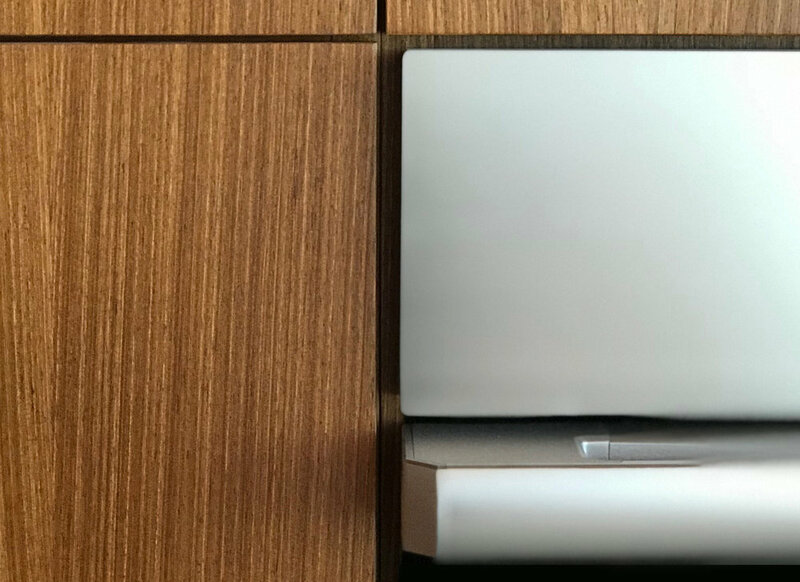 Shown here as an option in walnut—one of the many finishes we offer to our clients—it features dovetail-box drawers and a seamless construction. Some other products we selected to complete the kitchen include countertops and a backsplash from Corian, appliances from Dacor, fixtures from CEA, and counter stools from Fyrn. We were thrilled to announce that our Axiom Desert House in Palm Springs was selected as one of just two Featured Homes that made a debut at Modernism Week in February 2019! We were honored to be a prime destination during this prestigious two-week-long design festival. Here in Palm Springs, we watched the kitchen at Axiom Desert House come to life as Dacor expertly installed stunning products from their new Modernist Collection. We worked closely with Dacor to ensure that our custom built-in cabinetry, which we designed and manufactured, would fit seamlessly with the sleek, innovative appliances that helped us fulfill our goal of keeping the house fossil fuel-free. At Modernism Week, Turkel Design took part in three compelling panel discussions as Axiom Desert House made its debut, including Choosing a Desert Palette: A Colorful Discussion—moderated by Fig & Nash Interior Designer and Creative Director Mick Fox, and joined by Meelena Turkel and Dunn-Edwards Color Expert & Stylist Sara McLean. Illustration by Dunn-Edwards. That’s a wrap! Joel and Meelena Turkel spent some quality time behind the camera for a small series of Dwell videos produced by 22 Waves Creative—gearing up for a busy Modernism Week full of home tours, design discussions, and parties at Axiom Desert House. Furnishings from Resource Furniture, lighting design by Tirschwell & Co. Inc. Lighting Design, lighting by Cerno and Eklipse Architectural Lighting, living wall by Suite Plants, windows and doors from Marvin, paint from Dunn-Edwards, beams from BC Timberframe, and a thermally treated ash ceiling liner from Thermalwood Canada. Dwell x Dacor Video Live! Dwell and Dacor sat down with Joel and Meelena Turkel to discuss the inspiration behind Axiom Desert House, and why we use prefab as a means toward beautiful, timeless, high-quality design. Click here for the full story and video offering a behind-the-scenes look at our Living Lab before it was completed for its debut at Palm Springs Modernism Week. Follow us back to our intimate design salon at Axiom Desert House, co-hosted alongside Marvin during the home’s debut at Palm Springs Modernism Week. Joined by an engaged crowd of modern design fans and moderated by Michela O’Connor Abrams of MOCA+ SF, Joel Turkel and Christine Marvin discussed what makes a fruitful design partnership, the careful thought that went into this collaboration, and how to create a livable, indoor/outdoor space. We worked with a number of esteemed partners who played an integral role in bringing this house to life. They are each members of our Preferred Vendor Network, a trusted group of vendors that we recommend to our clients when specifying products in their new homes—for everything from appliances and hardware to furniture and lighting fixtures. Each of our partners in this program have been carefully selected due to their high-quality products that fit naturally into our homes. Our goal is to simplify the process of choosing specifications by suggesting a highly curated selection of well-made, beautiful options based on each client’s budget. Our firsthand experience with each of these partners and the products they offer provides us with confidence when specifying them for our clients—making this step of the process as seamless as possible.